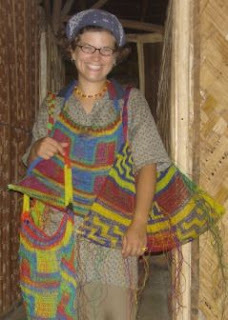 Cris taught us how to make a “bilum” – a bag traditionally made from natural rope. It is now generally made from thin plastic-y string by lowland/coastal people (which is where I was for POC/village living), and wool-yarn by inland/highland people (which is where I am living now, at Ukarumpa). The bilumin my hand is the one that I started when I was learning how to make a bilum. After I got the hang of it, Cris helped me, so that it would be finished by the time I left the village.